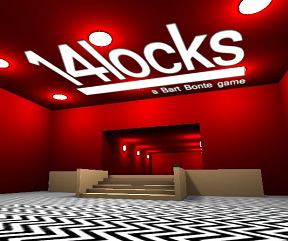 14 Locks is a new Unity platform based game developed by Bart Bonte (of Factory Balls and Sugar, Sugar fame). Why 14 locks? It's not like 14 is a lucky number, at least not in European cultures. Nor is it considered an unlucky number, or a magical number, or anything like that. 14 isn't a prime number either, so there's a pretty big mystery right there. Then again, is 14 Locks a room escape game? Is it a puzzle game? Well, it's a bit of both, really, with a little bit of platforming thrown in as well. All you need to do in 14 locks is make your way through a series of rooms, finding and opening the doors from one to the other. Sounds simple, doesn't it? However, each of these doors is locked, you see, and you must depend on your exploration and observational skills to find out the three digit combination for each lock. 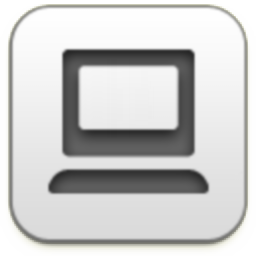 Move around the space using the [WASD] or [arrow] keys and use your mouse to move your observational point of view. 14 Locks is in true 3D, so using the mouse gets you swooping 360 degree in every direction views, which can be a little nausea inducing at first. Eventually you will (hopefully) discover both the combination and the location of the doorway out and move on to the next room. Although the movement and viewpoint controls are pretty easy to learn 14 Locks could have benefited from some more control features. You can exit out of the game but there does not appear to be a way to save your progress, forcing you to start over. For those who get motion sickness from the dizzying movement, it would have been nice to be able to save and come back later. The music is pretty funky and amusing, but it is nice that you can use the [m] button to mute it after a while. And playing the game requires that you have the Unity plug-in for your particular web browser. There's not a lot of substance to 14 Locks. It's not strictly an escape game (not a lot of pointing and clicking and very little puzzle solving), but it is still fun to navigate your way through the imaginatively decorated spaces, each one becoming more elaborate than the last. According to Bart Bonte himself this was simply an exercise for him to learn Unity. Exercise or not, he has still created something that is pretty exciting and amusing to play. Take your time and enjoy exploring this fantastic three dimensional world of rooms and corridors that Bart has created. Note: This game can be nausea inducing. Those who are prone to vertigo or motion sickness should be very careful and take a break if necessary. 14 Locks Walkthrough now available! Move around using the [WASD] or arrow keys. Use the mouse to control the direction you are looking. This is a 360 degree control. Once you find the door in the room move towards it until the keypad locks into place in front of you. If your combination doesn't work the first time use the * or # keys on the keypad to back up from the door to try again. Don't forget to look everywhere for your clue. It could be anywhere or anything. This game uses European numbers, so remember that the sevens have a small dash across the middle. This room has dark brown walls and a tan floor. There are yellow beams in the room. Once you orient yourself, go forward until the room opens up, then look left. You should see a three digit number clearly on the wall. Once you've found the number, go forward to the end of the room (past the pillar) then left to find the door out. This is a room with red walls and a black and white checkerboard floor. Keep going forward and turning left, this is a bunch of corridors. Eventually you will see two notches in the right wall as you are moving forward. Go and look into the second notch and you will see the three digit number. Keep going forward and turning left until you find the door out. This room has green walls, a tan floor, and three large brown pillars in the middle of the room. Move to the left, and slowly make your way around the pillars. Notice the shapes of the pillars. They are actually the shapes of the numbers. Once you've figured out the numbers, go past the pillars and left to find the door. This room is blue with a lot of ramps and corridors. Keep going up and to the right. After about your third right turn (after you've passed a neon blue beam) turn around and look back down the corridor. You will see three shapes on the wall, a pentagon, a triangle, and a diamond. Turn around and keep going up and to the right to find the door. This room has dark brown walls, tan floors, and bright yellow accents. As you move forward in the room you will notice a lot of bright yellow accents on the ceiling as you move towards the stairs. Look closely, the numbers are on the ceiling (and reversed). The first number is on the ceiling before the stairs, the second above the stairs, and the third in the area past the stairs. Once you've gone down the stairs and seen the third number, turn left to find the door. This room has dark green walls and a tan floor. Also we're looking at corridors again. Notice the bumps on the floor as you navigate the corridors. Keep going forward and turning right. Count the bumps in each of the three corridors. At the end you will reach the door. This room has red walls and a black & white zigzag pattern on the floor. Notice the stairs going to the other room. Move around the stairs and notice that there are actually three sets of stairs, one on the left, the large set in the middle, and a set on the right. Count the number of stairs in each set. Go up the stairs and move into the next area. Keep going forward to the door. This room is in shades of tan/light brown. When you enter the room notice the lights on the floor. Go left and you will find a ramp. Keep going up this ramp to the top of the room, as high as you can go. At the very top look down and you will see the number spelled out in lights. You can either go back down all the ramps or just move forward to jump back to the floor of the room. The door out is across the room from the door in. This room is a uniform blue, both floors and walls. Notice the three partitions in the room. Each partition has a bunch of holes in them in a 3 x 4 pattern, except that the pattern is missing one opening. This pattern is the pattern of the keypads on the doors. Look at each partition (from the perspective of coming into the room) and see which number on the "keypad" is missing in the pattern. Keep going past the three partitions until you have the code and have found the door out. This room is white, then red, then white again. Look closely, the path that is carved into the floor is in the shape of the numbers. The first number is in the white section, the second in the red section, and the third in the white section leading to the door. Follow the carved paths to the door. This room is blue (walls and floors). Go forward then to the right. You will enter a part of the room that has ramps. Notice at each level of the ramps you will also find orange balls with letters on them. Each group of balls, when the letters are unscrambled, spells out a number. Keep going up the ramps until you find the door out. This room is mostly dark brown and yellow with some purple. When you enter the room you are on a purple platform. Look closely, this platform is actually the first number in the combination. Go to the end of the platform and jump down to the floor level, then turn right. Keep going right until you are alongside the side of the big purple platform. Notice that there is an opening here. The shape of the opening is the second number of the combination. Once you go through the opening swing to your left and you will see the door. The door is recessed into an opening that is the shape of the third number of the combination. Go forward and you will fall all the way to the bottom of the next room. This room is mostly black & white checkerboard. Once you hit the bottom you will notice some beams and pillars in the room. Go forward towards the door. The place you want to find is the corner of the room to the left of the door. Get yourself into that corner and turn around and look at the room. The disjointed pillars will form the number for the door if you see them at the correct angle. This room is done in primary colors, blue, red, green, and yellow. To find the combination you need to get to the very bottom of the room. You can go down the ramps (there are a lot) but the easiest way is to find the edge of a ledge and jump down. Keep jumping until you are at the bottom. The floor at the bottom is white. Move around the room until you see a green/red pillar. Go around the pillar to the opposite side and you will see the number on the wall. Once you've found the number look around for a red ramp. This is the only ramp that will take you up from the floor level. Go up the ramp and you've found the door. Once you open the last lock you will be in a green corridor. Simply follow the corridor until you see the doorway outside. Go out the doorway to get the end credits. Argh, this needs look invert and a sensitivity slider. Aw, stink! Unity Web Player is a no go for me. Why not just use flash? Well, that was fun and easy. Bonte should go into interior design; this game displays a real taste for modern architecture. Pretty fun and easy game. Unique type of escape game. Bart said that he wanted to learn Unity, thus this little exercise in escaping. Is there any way to reduce mouse sensitivity in Unity games? They're always ridiculously sensitive and it makes some of them a huge pain to play. I had to take a few breaks myself mid-game because of the dizzying effects of the camera whipping around. The puzzles aren't that hard, but they're certainly creative :D.
How awesome would it be if we built this in reality? Fellow Jiggers, I think its time we band together to make this a reality. @crashlanding: Perhaps, but that drop right after the twelfth door would kill anyone! This one's pretty easy. I doubt you really need a hint. Just look around, same as in room 1. Especially investigate things that catch your eye. Alright, this one's a bit trickier, but still not too hard. The columns are the key. What would they look like if you saw them from above? ...go back and search again. My, what unusual ceiling decorations this room has! What would they look like if they suddenly crashed to the ground? Owww... I tripped over that dumb floor bump. Jeez, how many of those things are there? Ever been bored at a lighthouse? Well, there's a giant spiral ramp. What's your first instinct? You know, it would be great if I could see all those lights at once. Three walls, and three numbers to find. What else has 12 squares arranged like that? Wow, these sure are some funny-shaped pathways... You should know what to do by now. Hey, it's a giant game of Must Pop Words! I wonder what words I can spell with those letters? You should know the first number from the moment you walk in. What other things in the room resemble numbers? Wow, that was a big fall. I think I'll just sit down in the corner and rest. If the corner you're in is too uncomfortable, try another one. The code is written somewhere here, like in rooms 1 and 2. You just have to find it. This Unity player experience reminds me of VRML viewer/navigators from ten years ago or so, although to be honest I'm not sure how else you can combine a simple 3D space and the full freedom to navigate it. It also bugs me that there's no Linux version of the player. That rules out truly casual Unity gaming for me, I have to borrow my wife's computer to run it. Not to be too critical, though -- unquestionably the easiest Bonte game I've ever played, and quite pretty. just as simple as the first. Logical Ghost, I really didn't like that. I spent a good 5 minutes trying to find the pattern in the colors before resorting to the walkthrough. A total facepalm moment for me. My complaint with the controls was that this game seemed to be designed for a trackpad or such rather than a mouse. It was really awkward for the mouse to not be in the center to walk forward. In fact, there were times when it was off screen. Though this was not a problem for this game with the keypad being outside the 3d experience, something needs to be done if you want to be able to click something in the environment. I kind of like the click and drag method some 3d games use, though sensitivity would probably be even more of an issue. I enjoyed this lovely game except when I accidentally clicked on a banner ad at lock 9 and had to start over. Save feature in the future please! Keypads break if you resize the page. Strange, because other Unity games work properly... What can be the problem? Since it works for others, the problem must be in my settings, I guess... But then, why have I been able to play other Unity games without modifying the settings? PS: I tried it under IE Tab - it made the plugin crash every time... Tried it under IE 8, it made it crash, all three time I tried. Obviously very easy, but as the creator said, it was just an exercise in learning Unity, so well done! I have to say, I feel that the 3d open environment style is where escape games need to go. Most of the escape games I've played, with few exceptions (Neutral is the only one I can think of right now) are seeming more and more repetitive and similar too each other. Especially tesshi-e. I know alot of people here are fans of tesshi-e, but I have to say, I'm not. Tesshi-e games rely too much on randomly found POVs and items that you have to simply get lucky to find. I know, I know, he's been getting better with the pixel hunting, but still, the games are really starting to seem recycled for me. He cranks one out every week or so, how varied could they be? If escape games moved into this kind of environment, not only would it eliminate the pixel-hunt frustration, but it would add a whole new element to the game. Instead of looking for the spot to trigger the POV, how about looking for a POV yourself, like in level 13 of this game? I thought that was a nice example of the possibilities of escape games in 3d. I gave up after about 6 levels, feeling a bit nauseous and bored. I'm using a track pad. It felt frustrating having to go from the trackpad to forward arrow- I couldn't see any other way of moving forward using the trackpad alone. The controls would benefit from an option for controlling the sensitivity- and perhaps consider setting different levels of sensitivity for up and down movements. We're not running up the walls after all, just looking...so don't need quite so much fluidity as left and right controls. I did like the little bumps going over the lights. Nice touch. I was surprised that I did not feel nauseated, given all the comments to that effect. lose control and get literally taken along for a ride? I didn't have to search for anything, it deposited me right by the number, then took me to the door. I didn't touch any of the arrow keys, all I had to do was steer with my touchpad. I didn't have the problem with nausea or vertigo ... in fact, I really enjoyed zooming around and wished I could've gone a little faster! The puzzles were very enjoyable, but I did have to use GrinnyP's walkthrough on one level because I just couldn't see the solution (even after I read the solution!). Thanks to Wyatt for the post about zooming in FF. I couldn't get the keypads to work until I un-zoomed. I had to leave for work after Level 9 and wish I could have saved the game ... thanks again to GrinnyP for keeping us all out of trouble for a while! a wonderful game! the 3-d made me dizzy, but I loved the immersion-factor that it created, as if you actually were in these rooms! it would be a fun place to go in reality too. I have just uploaded a new version of 14locks, with improved movement, let me know what you think! Okay, I've tried the new version and I think it's really good. No nausea this time! I think this speed/sensitivity is great as the default.It needs a speed button too though. (I know, I know, we're never happy.) I found that as I got used to it I wanted to go a bit faster at times- particularly down corridors. I found the 3D experience really good. And I found the "w" key for moving forward when using trackpad with right hand (duh). I look forward to playing your next games using this. I'm going to second the above complaints about unity's mouse handling. It should capture the mouse or have a feature to capture the mouse. Full screen has unexpected graphical/interface errors keypad, overlay items out of place (like the information about mute). I think you did an excellent job on this especially for a first time coding for Unity. Keep em coming! I loved this! The idea that solving puzzles gives you access to new areas to explore motivated me to open every door. The difficulty was a little low, but the general variety of the puzzles was good. All but a few of them utilized the 3-d in clever ways. I felt like the rooms were generally pretty bare. While clutter could make the puzzles more difficult than they need to be, it would make the world even more fun to explore. If there were some furniture or posters scattered about to look at, it would have made the game even more fun to play. More windows (like in the early puzzle where the combination is hidden in a parallel room) would have given the complex a feeling of more depth. A great first attempt at 3-d! Definitely looking forward to more games like this one! Very fun! Well done! Somehow reminds me of The Cube, except without all the boobytraps and gore. Maybe you can make a game called 14 Traps next. I played just it for a second time, unfortunately the replay value was about 000. I wonder if an element of randomness could be added to change the sequence of numbers, or the numbers themselves, to make gameplay different each time. I love the premise, but the navigation STINKS. To me, an intuitive way of moving around with the arrow keys would be to have left and right turn the view, then leave forward and back the same. Fun up to level 7 when I had to drop out and get some fresh air. Not felt that sick since playing Doom. @steeny124: Because Flash "stinks" for 3D. And Unity is awesome. I really hope Bonte does a sequel to this with more complex puzzles. I'm not to big a fan of his "escape the room" games but that would be an interesting concept to be used with Unity as well. The game play wasn't too nauseating for me, it was actually relaxing, wandering around the oddly designed rooms.